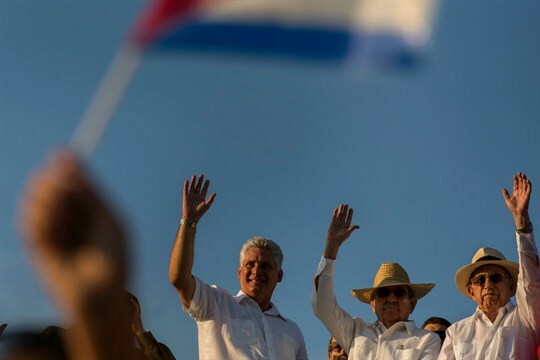 Cuban Vice President Miguel Diaz-Canel, left, President Raul Castro and Vice President Jose Ramon Machado Ventura watch the May Day parade at Revolution Square, Havana, May 1, 2016 (AP photo by Ramon Espinosa). In this week’s Trend Lines podcast, WPR’s editor-in-chief, Judah Grunstein, senior editor, Frederick Deknatel, and associate editor, Robbie Corey-Boulet, discuss the U.S. military presence in the Sahel, after the deaths of four American Army Special Forces operators in Niger. For the Report, William LeoGrande talks with Andrew Green about Cuba’s upcoming leadership transition and whether a new generation of political leaders can satisfy Cubans’ growing expectations for economic reform without a Castro in charge for the first time since the revolution.